Mayflower Medical Outreach, the University of Nebraska at Lincoln School of Audiology and Brookline-Quezalguaque Sister City Project in coordination with Nicaragua’s National Reconciliation and Unification Government, through the Ministry of Health in the municipality of Quezalguaque offered audiology services to several hearing impaired patients. 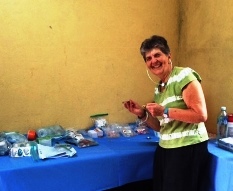 “It seems like such a great idea to make a connection between the University of Nebraska and Brookline-Quezalguaque Sister City Project bringing audiology support to the families of Quezalguaque,” said Judith Chasin, Brookline-Quezalguaque Member. Chasin, said that Mayflower Medical Outreach, has about 16 years of working in northern Nicaragua, providing audiology services to the families of Jinotega, Matagalpa and Esteli. A clinic will be established in the Leon community within the next year. Patients were examined by specialists in order to assess whether or not they warrant the use of hearing devices therefore making it available to them. Matriarch Petrona Martinez, said it is great that the government and other agencies assist families this way, since purchasing these devices themselves is a financial struggle. Boy being fitted with hearing aid. This event is primarily intended for people diagnosed as critical case, but will also be assisting those not integrated into this program. Milagro Baldelomar, County Delegate to the Ministry of Health, said Todos Con Voz (Everyone With a Voice) program is designed to assist people who have hearing problems but also would be assisting those who are not part of this government program. This great health project is thanks to partnerships created by the government for the welfare and tranquility of Nicaraguan families. The story was originally published by Multi Noticias, Nicaragua.